A house on Adamsville Road in Mason was destroyed by fire Tuesday evening, with the cause reportedly being from a deep fryer in the kitchen. 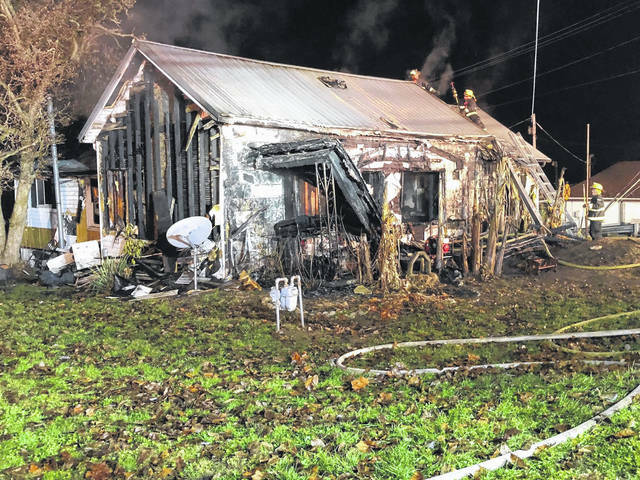 One of the home’s occupants received burn injuries and was taken to the hospital by the Mason County EMS, according to a spokesman from the Mason Volunteer Fire Department. MASON — A four-alarm fire on Adamsville Road in Mason left one of the home’s occupants injured, according to a spokesman from the Mason Volunteer Fire Department. The fire occurred Tuesday evening. Firemen were called to the scene at around 7 p.m., and arrived to find the house fully engulfed, according to spokesman R.C. Faulk. The house is located next to the Stewart-Johnson V.F.W. post. While the residents of the house were outside when the firemen arrived, the Mason County EMS transported one resident who had burn injuries to Pleasant Valley Hospital. The unknown victim was later transferred to a Huntington hospital, Faulk said. A total of 25 firefighters from Mason, New Haven, Pomeroy and Middleport departments fought the blaze for approximately two hours. Faulk said the firemen were told by the residents that the fire began in a deep fryer in the kitchen. He added the fire burned so hot, and so quick, that it collapsed the metal overhang on the porch. Soon after the fire began, people on social media were reporting seeing the blaze and posting photos from as far away as Powell’s Foodfair grocery store in Pomeroy, as well as the Bridge of Honor (Pomeroy-Mason bridge). Red Cross representatives were also on the scene, Faulk said, and had found the occupants a place to stay before the fire departments had left the scene. The fire marked the third major blaze in Mason in three weeks. The first was Nov. 15 when a mobile home, belonging to Brenda McCarty, was destroyed on William Lane. That fire remains under investigation as possible arson. The second occurred on Nov. 18 on Third Street, when a two-story house occupied by Ashley Smith caught fire. That fire is believed to have started on the second story due to an electrical issue. Faulk reminded residents to be extra cautious at this time of year, when using space heaters and burning holiday lights. He emphasized the heaters, as well as Christmas tree lights and lighted decorations, should never be left unattended.